Pianta della citta di Sant'Iago Capitale del Regno del Chili. 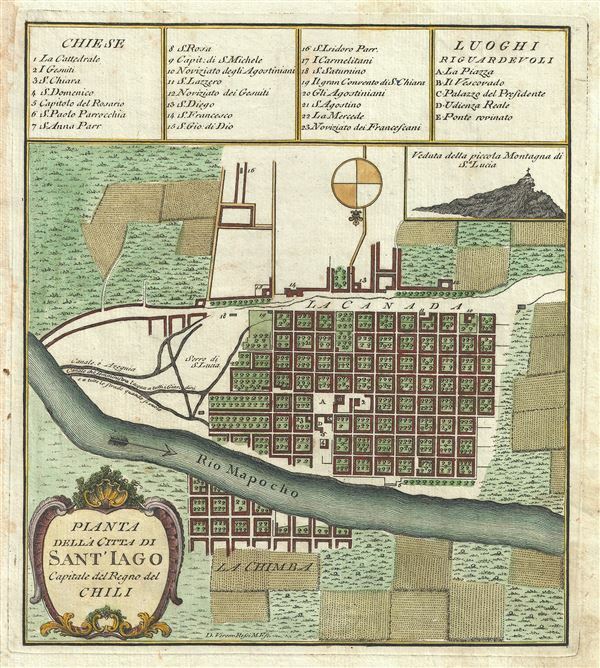 This is a beautiful 1763 map or city plan of Santiago, Chile, by Marco Coltellini. Centered on the Mapocho River, it beautifully renders the capital city. The map is oriented to the south and notes roads, rivers, individual buildings and several important places of interest. A key to the locations in included on top of the map. A profile view of the small mountain of St. Lucia is included in the top right quadrant of the map, below the key. Relief is rendered in profile. This map was drafted by D. Veremondo Rossi and included in vol. 2 of the 1763 edition of Il Gazzettiere Americano.